joy magnetism: David? Who's David? Found a small gold box under the Christmas tree, addressed to me, from someone named David. I asked my sister, David? Who's David? She laughed at me when I opened it, and found this. 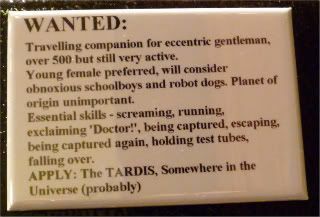 Not for nothing, but I think I'd make an awesome companion. In real life. Not on television. You know, for when the TARDIS actually shows up at my door. In real life. Not on television. The magnet came just in time, too, since we all gathered round to watch the latest Doctor Who Christmas special. On Christmas. In real life. On television! But, I need to rewatch it again, to see if I really did like it or not. The general consensus around the folks I keep up with is that they all loved it. Like people are even saying it's the best of the bunch. I dunno if I agree, though. I mean, I really liked the flying sharks concept. A lot. It's classic Moffat, taking something ordinary and making it extraordinary. I also loved the "Dame" Katherine Jenkins being a shark-whisperer with her harmonized yadda-yadda-blah-blah-blah. In her first acting role, the songstress actually did a pretty good job. I liked the Steampunk aspect of it, even though jury's still out on whether or not I love the genre, or just those damned goggles. And, even though I can't stand any retelling of A Christmas Carol, Moffat did an excellent job giving the old standard just enough of a twist to not make me crazy. But, overall, something was off for me, and I can't for the life of me, figure out what it was. I won't lie, it could possibly be because it wasn't David. But I'd like to think I'm giving Matt Smith a fair chance as the Doctor now, and not really missing David Tennant. So, yeah, I need to watch it again to figure out what, because clearly, all of the above should have meant that I liked it. Right? One thing's for sure, I absolutely loved that BBC-America finally aired a Doctor Who Christmas special on Christmas Day. Totally made our night...and saved me from having to find it via alternative methods. Thanks, BBC-A! And, in case it isn't posted enough everywhere, on every blog, webpage, Tweet, Tumblr, etc., here's the Series 6 trailer for ya. C'mon, you know you want to watch it again!